But the problem is that most startups try to hire for skills and experience that are irrelevant, while failing to focus on the essential few skills. Typical job descriptions are often laden with generic but seemingly necessary requirements like an ability to establish a strategic marketing plan to achieve corporate objectives, build and manage the marketing team, manage outside vendors, etc. After product-market fit and an efficient conversion process, the next critical step is finding scalable, repeatable and sustainable ways to grow the business. If you can’t do this, nothing else really matters. So rather than hiring a VP Marketing with all of the previously mentioned prerequisites, I recommend hiring or appointing a growth hacker. An effective growth hacker also needs to be disciplined to follow a growth hacking process of prioritizing ideas (their own and others in the company), testing the ideas, and being analytical enough to know which tested growth drivers to keep and which ones to cut. The faster this process can be repeated, the more likely they’ll find scalable, repeatable ways to grow the business. Not all growth hackers can or should evolve into VPs of marketing. A VP marketing needs to be able to help shape the overall company strategy, build and manage a marketing team and coordinate outside vendors among many other responsibilities. Some growth hackers will be great at this, while others will be bored out of their minds. The important thing to note is that without some proven scalable, sustainable ways of growing the business, these things will not matter. Some of my favorite conversations are those I have with fellow growth hackers. Last week in San Francisco, I had breakfast with three fantastic growth hackers and we traded insights that benefited each of us (don’t bother asking me for names to try to recruit them, two are CEOs and the other is VP User Growth at a very hot company). I’m a big proponent of establishing and building a broader community of growth hackers. The problem is that not all people are cut out to be growth hackers. If you think you are a growth hacker, please post a link to your LinkedIn profile below so other growth hackers in your area can connect. Update Oct 2013 – If you want to get inspired to develop effective growth hacks and engage with other growth hackers, check out our new project at GrowthHackers.com. I once believed optimization was the secret weapon that could make almost any startup successful. It was certainly a critical part of reaching millions of users in each of my first five startup marketing roles. At a couple of startups we saw a tripling of conversion rates from a single experiment. When we tripled conversion rates, we tripled the effectiveness of every future marketing dollar. I first became a fan of funnel optimization at one of my early startups where we had hit a wall trying to develop scalable customer acquisition channels. We decided to temporarily stop trying to find new customer acquisition channels and focus instead on improving conversion rates. A few months later we resumed channel building and were able to scale the same previously tested channels to support 100X the marketing spend with the same target ROI per dollar spent. Beyond the clear benefit of enabling scalable marketing campaigns, the improved user experience also resulted in a multifold increase in free organic growth. User growth immediately hockey-sticked and years later still hasn’t diminished. All the while, the company maintained cashflow positive results. These benefits probably have you chomping at the bit to start your own optimization program. But be careful, optimization can easily kill a startup when not done right (or at the right time). 1) Premature optimization – Optimization is about improving the path that users take to reach a certain destination within your website. For most sites it’s ultimately about getting people to experience and buy your product. While this seems like an important goal from the beginning, it’s not. If the value of your core product is weak, doubling the percentage of users that get there won’t help much. And it will actually hurt you because every unit of effort put into optimization is one less unit that you can put into improving your core product. Products that don’t become a “must have” almost always fail. My recommendation for startups is not to begin optimizing until at least 40% of your randomly surveyed users say they would be “very disappointed” without your product. That doesn’t mean you shouldn’t try to have a great first user experience, rather it means you shouldn’t start iterating flows until the core product meets this threshold. The only exception to this is if your value proposition will increase because of a network effect (like eBay). I’ll try to write a post on this scenario soon. 2) Not being deliberate –To execute full funnel optimization you test multiple changes at every step in the acquisition process. Since every change is also an opportunity to screw things up it’s extremely important to measure the actual results of a change. Unfortunately traditional analytics programs aren’t helpful here since they don’t track specific user cohorts moving through the funnel (AKA groups of users). In the early startups I worked with we spent months building systems internally to track conversions at the user level. Fortunately “off the shelf” systems are now cropping up that make user level funnel tracking much easier (I’ve been advising KISSmetrics on such a system for over a year and I’m now using it in a couple projects). With the right system you can track your “measures of success” and roll back any changes that havea negative effect on these metrics. This presents a new problem. Anyone with a basic understanding of statistics will realize that optimization is a numbers game. If you test enough things you will definitely find something that improves your key measures. That’s the theory, but the reality is that you’ll never get past the first few tests if the early ones don’t yield improvements. People quickly lose faith in the process. Therefore it is essential to vet every test idea before asking the development team implement it. Prioritize test ideas so that the easiest and/or most likely to improve results are implemented first. 3) Killing the love – One thing that is rarely measured in an optimization project is a reduction in the core value perceived by your most passionate users. Your ability to deliver an experience that creates passionate users is your most important asset as a business and must be protected. It can be improved, but it must be done very carefully. The first step in protecting it is to understand it. I never attempt an optimization project without first doing a project that helps me understand the use cases of the most passionate users. After this initial project, which I combine with messaging optimization, I am in a much better position to safely optimize the full conversion funnel. Effective optimization requires the right tools, qualitative research/understanding and a systematic approach to testing. When executed properly it can easily result in 2X – 10X improvements in conversion rates. No business will come close to its potential without a concerted optimization effort, but be careful to avoid the mistakes listed above. For more context on where optimization fits into the overall startup marketing priorities, see this post on The Startup Pyramid. When your startup accepts outside money (such as venture capital), you are obligated to focus on maximizing long-term shareholder value. For most startups this is directly based on your ability to grow (customers, revenue and eventually profit). Most entrepreneurs understand the importance of growth; the common mistake is trying to force growth prematurely. This is frustrating, expensive and unsustainable – killing many startups with otherwise strong potential. Most successful entrepreneurs have a good balance of execution intuition and luck. This was definitely the case at the two startups where I ran marketing from launch through NASDAQ IPO filings. While we didn’t follow a specific methodology, our CEO was intuitive enough to know the right time to “hit the gas pedal.” We didn’t accelerate until verifying that the team had created a great product that met real customer needs and we could generate sufficient user revenue to support sustainable customer acquisition programs. It’s taken years for me to realize that our growth was less a function of clever marketing tactics than beginning with something that customers truly needed. Some growth would have been automatic; the marketing team simply accelerated this growth. Several startups later I have a much better understanding of the key milestones needed for a startup to reach its full growth potential. These are based more on observing universal truths than inventing some type of methodology. Reaching the full growth potential of your startup requires focus, specifically focusing on what matters when it matters. In my post on the startup growth pyramid I talk about the high level milestones you must achieve in order to unlock sustainable growth. This post looks at it on a more granular level with links to several of my previous blog posts and other resources that provide additional details. Before any coding begins it is important to validate that the problem/need you are trying to solve actually exists, is worth solving, and the proposed minimum feature set solves it. This can best be achieved by meeting with the prospects most likely to need your solution. Steve Blank has published a great post on this. Eric Ries offers more details on the minimum viable product concept in this post/video. For you this means you should start looking for a signal about who loves your product and why as soon as you release your MVP. Most products have at least a few people that truly consider it a must have. These people hold the keys to the kingdom. Learn everything you can about them including their specific use cases and demographic characteristics. Try to get more of these types of people. A good place to start collecting this information is the survey I’ve made freely available on Survey.io. You can read more about this product/market fit survey in this blog post. If you’re lucky you’ll be able to use this early signal to find the product/market fit. The majority of our project focus at 12in6 recently has been helping startups find their core user perceived value and exposing it in messaging optimized for response. Your objective should be to remove complexity from the initial user experience and messaging in order to highlight this core user perceived value. Often this means burying or even completely eliminating features that don’t relate to this gratifying experience. Metrics don’t matter until you achieve product/market fit – then they are critical to your success. Dave McClure has a great video on startup metrics that matter (relevant part is at about minute 2:20). Most of the tools out there provide way too many irrelevant metrics and miss the essential few. Both Dave McClure and I are advising KISSmetrics on a solution to this problem. Another key step before growing your business is to implement a business model. The ideal timing for implementing your business model is discussed in this blog post . 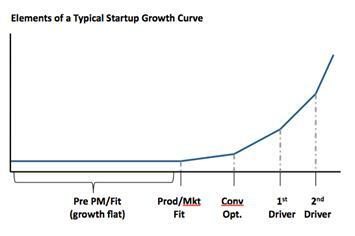 I’ve often heard the argument that startups are focused on user growth and prefer to delay revenue in the short term. I believe the fastest way to grow is with a business model and explain why in this blog post. Now that you have a business model in place, your first marketing expense should be to expand the customer support team. Anyone that cares enough about your solution to contact customer support is a great source of insight about your target market. Also, customer support will uncover issues that will help you grow faster without spending. And fixing these issues will make it much easier to grow when you do start spending. If your customer support team is overwhelmed now, I don’t recommend trying to grow until you address the issues driving most support calls. Once you’ve addressed these issues you’ll have fewer barriers to adoption and will be able to grow without overwhelming customer support. This will enable customer support to go above and beyond expectations, which is an important way to drive customer loyalty and enhance word of mouth. This approach pays more dividends today than ever before – as I explain in this post on Social Media. Update: See comments for additional thoughts on extreme customer support. Back in the “Dotcom Bubble” days billions were wasted on brand awareness campaigns for startups. Today most entrepreneurs understand that brand awareness campaigns are a waste of money for startups. Instead, it’s much cheaper and more effective for startups to focus on creating a fantastic brand experience. While startups often realize the importance of brand experience, they focus on it too early, fine tuning things that customers don’t care about. Instead, wait until you understand why certain customers love your product; then obsess over every element of this customer experience. Apple is probably the best tech company out there on coordinating a perfect brand experience for its target users. I cover more on brand experience in this blog post. Once you’ve achieved all of the previous milestones, then you can focus on driving growth. CEOs must take an active role in driving customer growth whether or not they have an interest in marketing. Nearly all of the risk and upside in a startup is in your ability to gain customer traction and then drive scalable customer growth. The CEO should not abdicate this responsibility to the marketer. It’s important to stay aggressive and take all slack out of the market (make it completely uninteresting to pursue the market for any other competitor). Your early advantage is the ability to iterate on the customer feedback loop and leverage strong customer loyalty to drive word of mouth. While ROI lets you know if a user acquisition channel is sustainable, the key focus should be on exposing lots of the right people to your fantastic product experience. It’s much easier to get passionate and creative about this than purely thinking about things from an ROI perspective. Of course positive ROI is essential for any customer acquisition program to remain in the mix. When it’s time to hire a marketing leader to partner with the CEO, this post explains my recommendations for an ideal startup marketing leader. The most effective startup marketers are relentless about experimenting with channels until finding things that work. Start by building out free channels such as listing in directories and basic SEO. When you begin building paid channels, extra effort should be put into channels that show strong potential for scale. Unfortunately you can’t count on effective online tactics working forever. I’ve seen many hot online marketing tactics lose their effectiveness over time. This is because online tracking makes it easier for marketers to quickly figure out what actually works. As a result we start piling into the most effective tactics. Eventually online tactics get saturated, as explained in this post. Fast growing businesses are difficult to manage. This is the point where you should bring in some experienced operations people if they aren’t already on the team. You lose patience and decide that one or more of the milestones really aren’t that important. VCs and/or board of directors lose patience because you did not achieve conceptual agreement on this approach from beginning. You delude yourself into believing that for “our type of business” customers really don’t need to consider our product a “must have”. For us, “nice to have” is good enough. Building a successful business is hard. Hopefully this milestone driven approach to growing your startup will make it a bit easier. Update: It’s hard to write a blog post on “milestones to startup success” that covers every type of startup. Some startup types may need to reverse the order of some of these milestones. For example, with marketplaces (EBay, social networks, dating sites, etc.) user gratification increases with more users so there is a bit of chicken and egg here… Ad supported sites also benefit from early scale. Many of the articles linked to from this blog post also cover exceptions such as when a startup should start charging (it’s different for enterprise targeted startups). CEOs often ask for my advice on the ideal candidate profile to lead their ongoing customer growth efforts once we’ve completed the key steps to unlocking growth. You would think that after running marketing at two startups through IPO filings that I could easily answer that question. But I’ve struggled to define the ideal profile of a successful startup marketing leader. After many course corrections, I finally believe I have it figured out. But to really understand the ideal profile, it is important to comprehend why the role is so challenging. Based on anecdotal evidence, I’d guess that 90% of startup marketing leaders don’t work out. This corresponds to the overwhelming majority of startups falling short of expectations of founders and early investors. When a startup falls short of expectations, the startup marketing leader is the first to go. Even those fortunate enough to gain early user traction still face the uphill battle of finding cost effective ways to acquire users at scale. And if they do succeed, then startups are often tempted to hire a “next level marketer” to replace them. A successful startup marketing leader must be undaunted by these risks and believe they uniquely have what it takes to succeed. That sounds a lot like the profile of most startup founders. So it’s not surprising that the best startup marketers are entrepreneurs at the core. Entrepreneurs are willing to take the risk and are generally tenacious enough to uncover the channels necessary to drive long-term growth. I came to this conclusion after finding the common thread between myself and the two most effective people I’ve met at uncovering growth channels. One is still CEO of his company but has done more to drive customer adoption with a fraction of his time than most startup marketers do with undivided attention. The other highly effective startup marketer is a founder that transitioned to leading marketing. They share a persistent desire to connect their innovative solutions with the people that really need them. After implementing critical tracking systems and an efficient customer acquisition process, they are now relentless about experimenting with channels until they find things that work. Contrast this to a typical marketer, who is generally more focused on marketing activities than marketing results. Most of these activities do nothing to move the needle on the business, but make the marketer feel good because they are working hard. It may be tempting for a startup CEO to read this and think that aggressive targets can steer the marketer in the right direction. I don’t think that will work. Effective marketing leaders will challenge themselves by pushing the boundaries of the startup’s growth potential. The CEO should be a partner in this process rather than setting arbitrary unrealistic goals. If you don’t have confidence in your marketing leader, the founding CEO should micromanage the process by being an active participant in channel brainstorming sessions and challenging the marketer to ensure tests have been implmented to perfection. Once you have created a product that people really want, most of the remaining company risk and upside lies in your ability to aggressively drive customer adoption. This is not something a CEO should abdicate to the marketer until they’ve demonstrated a relentless drive to uncover profitable customer acquisition channels. The CEO can also facilitate channel discovery by ensuring that the marketing leader gets the tracking systems they need to execute marketing efficiently. Of course the marketer should be able to make a case for why these resources are important. What about successful startups that had an initial marketing leader with a more traditional background? First, there is nothing wrong with a traditional marketing background if at the core the marketer is entrepreneurial. Second, the marketer does not always deserve credit for strong user growth. Sometimes great products really do market themselves. My experience with Dropbox certainly supports this assertion. Also, I recently spoke to the former VP Marketing at a company that sold for billions and he agreed that his most important growth contribution was not getting in the way of the viral growth engine. Of course the risk in hiring an entrepreneur to lead your marketing is that they’ll eventually leave to start their own company. Agree that this is an acceptable outcome if they are willing to give you at least a couple years. Finally, only the marketing leader needs to be entrepreneurial. In my experience, it is not an essential characteristic for the rest of the marketing team.